Archive for the ‘wreck dive’ Category. 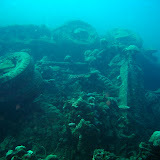 Notes: This was our last dive on the Coolidge and in Vanuatu. The aim was to have a look a the swimming pool which is towards the stern of the ship (the deeper part) and a few other things on the way back. After a long surface swim we descended almost directly to 55 m or thereabouts, hovering above a large gun turret which had fallen to the seabed. Gary and I quickly reached down to register 60 m on the computers before following Eithne and Alfred to the swimming pool. 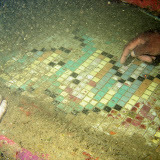 The mosaiced tiles were still in tact and clearly visible. Above the pool was a soda fountain with glass coke bottles lying nearby. We then made our way back to the bow (this part included some penetration, but I don’t remember what we saw) for a quick group photo and then on to the deco stop where we played waterproof Uno to pass the time (23 mins). Gary needed to use Alfred’s pony bottle towards the end and I used the drop bottle at the deco stop. Might have been able to do without, but it wasn’t necessary. After the dive we went back again to Allan Power’s house for some book and t-shirt buying and a few more photos. Notes: This was the only non-Coolidge dive we did on Santo. Million Dollar Point is where the Americans dumped a huge amount of equipment after WW II. Some time after the war ended they were preparing to leave and they tried to sell the equipment that they would not bring home (it was an economically-motivated policy not to bring equipment such as trucks back to the U.S.). The English/French colonial government would pay no money for it because they thought they’d get it for free in the end, so the Americans dumped it all in the sea to spite them. It’s still there, in addition to the wreck of an island trader boat used at one point in a salvage operation. We saw lots of trucks and machinery, as well as mounds of unidentifiable debris. Eithne, James, Gary and I were on the dive along with Alfred the guide and another guy (who ran out air near the end). Eithne somehow had a coughing fit underwater and was annoyed I didn’t notice. I took a few photos.. The strobe wasn’t much help for the seascape style ones. If I were given the choice again I would opt for a seventh Coolidge dive, rather than this one. Notes: There was a surface swim of 100 m or so to begin, then a fairly direct descent to the engine room, easily accessed through holes in the hull from some salvage operation. At 40 m, the daylight was sufficient to see huge mechanical components, covered in fur. Through a narrow gap then into the confined control room (46 m), where valves, controls and glass-covered gauges were clearly visible. We took a scenic route out, through passages and past a sign for the dining saloon and a room containing a thickly encrusted rifle on a bench. There were more narrow gaps to navigate and while queuing for these I tried to relax completely to use less air. Back to the coral garden then for some fairly long deco, photographing fish not willing to pose. 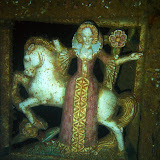 Notes: We went deep into the wreck to see ‘the Lady’, a decorative ceramic wall fresco located in the first class dining room. Heading towards the stern the floor was on our left and the ceiling was on our right, chandeliers covered in marine fur and hanging sideways. After a few photos with the Lady, we had a look into an elevator shaft, before going to the medical supply room where various jars of coloured substances were visible. We swam out of the wreck through cargo hold number 2, checking out some flashlight fish en route (a taste of the night dive). 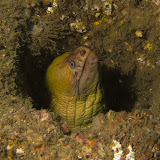 We visited Nessi, the wreck’s resident Moray eel, hand fed by Allan Power and his staff for decades, before going on to the coral garden to do our deco and safety stops. Alfred handed out some bread at the stop so we could entertain ourselves by feeding fish. One enthusiastic one tried to take a bit of Gary’s hand too. Equipment: As previous dive. Hadn’t been able to fix torch strap, but tucking it into my wetsuit sleeve worked ok.
Notes: The first penetration dive on the Coolidge into cargo holds 1 and 2. Number 1 contained stacks of jeeps, very much in tact with front grills visible and the odd headlamp glinting in the torchlight. Inside the entrance to number 2, a metal panel had been removed to reveal the crew’s barbershop. A barber’s chair could be seen by torchlight, sticking sideways from the vertical floor. Inside the hold there was a big 155 mm anti-aircraft gun, a few trucks and other debris. Managing torch and camera in the dark enclosed space was difficult, so there are no photos inside. I did take some video though. 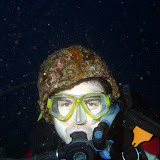 Equipment: As previous dive. Attachment from torch to BCD broke, so I had to carry it back- there were no zips on the pockets of the rented BCD. Notes: We flew to Santo from Vila on a Monday and got in touch with Allan Power dive tours that afternoon. On Tuesday morning we did the paper work and arranged to do seven dives in total: two dives per day on Tuesday, Wednesday, Thursday plus one on Friday morning, leaving 24 hours before our flight back to Vila at midday on the Saturday. We had the same guide (Alfred) for all dives but one. The ship is huge and lying on its port side on a slope. The bow is at 20 metres or so and the sand at the stern is at about 70 metres. The general plan we established with Alfred at the beginning was that the first dive would be relatively shallow (for this site), during which he would monitor our comfort and air consumption and so on. Then over the four days we would progress down the ship with deeper dives in the morning and shallower ones in the afternoon. 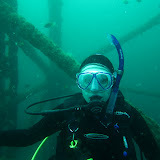 The first dive was also the only one on which we did not penetrate the wreck. Our Coolidge dive #1 then was an initial look over the bow. 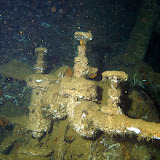 On the starboard side of the hull (the top surface now, with the ship on its side), there was much debris and a variety of encrusted artefacts including guns, a helmet, a gas mask and a typewriter. A helmet fit ok for a photo or two. Then we dropped over the edge to have a look at the A-deck, the main one at the front of the vessel, now vertical. It sported a large gun and the entrances to the number 1 and 2 cargo holds. 25 minutes disappeared fast. Back past the bow to the shallow coral garden for some decompression. Equipment: Rented: Mares size 5, 3mm wetsuit, Mares rebel reg, Mares bcd (didn’t record model). Own booties, fins, mask, computer, torch, camera. 12 lb weight. My mask leaked a bit for the first few metres but was fine a bit deeper.